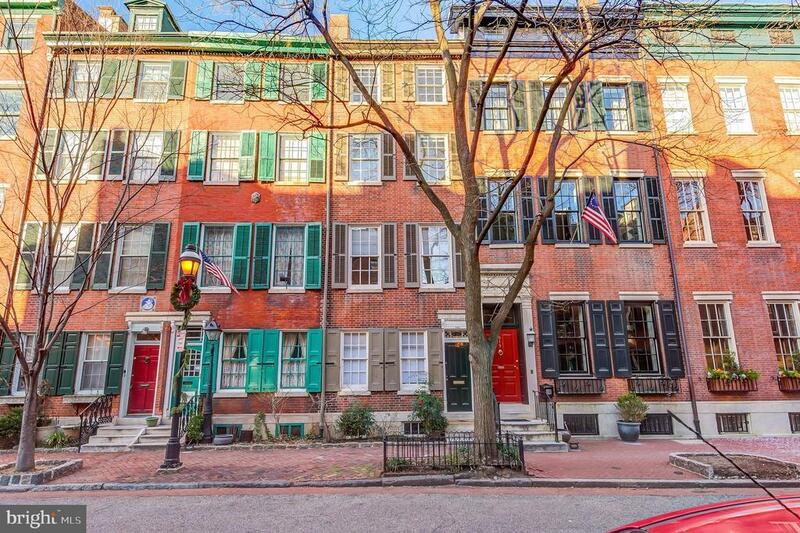 Historic, Renovated home on one of Philadelphias most special blocks. The former home of the renowned, quintessential Philadelphia architect Louis Kahn, this south-facing mid-19th century home offers spectacular original character, light, and location. It has 3 full bedroom suites plus a family room and an office, 3.5 baths, patio, and 2-car on-site parking. Exquisite original character, detail, hardwood floors, and woodwork. Renovated chefs kitchen and 2nd floor master suite. All windows replaced with energy efficient and sound attenuated historic windows. Not that you need to muffle much sound on this most quiet city block. Excellent storage throughout. A+ location. Not only a grand, quiet, tree lined block with historic homes; also a 98 WalkScore and 100 TransitScore. Walk to tons of restaurants and coffee shops, Whole Foods, ACME, Seger dog park, Midtown Village, Washington Square, Rittenhouse Square, public transportation, and just everything that Center City has to offer. If you, like Louis Kahn, have a superb eye for homes, then 921 Clinton Street is for you. McCall School Catchment.